There are turning points and there are turning points. But really folks, when it comes to the Civil War...Antietam has to be at least in the top three. Oh sure, people will argue whether or not this was actually a loss for the Confederacy, thus stemming the Autumn 1862 Rebel advance into Maryland, as it were. But the nugget here is that Lincoln claimed it as a Union victory, and thus used the occasion to issue the Emancipation Proclamation, thereby putting freedom on the table as a vital component of the Union cause. If that's not a turning point then I don't know what is. In That Field of Blood: The Battle of Antietam, September 17, 1862, Daniel J. Vermilya negotiates such territory well. Readers will note that he situates a profoundly significant presidential proclamation in the context of the war both in terms of its immediate implications as well as its broader meaning. Of course, this is a book about a battle...and so we get military history. What I appreciate is the scaled down approach - That Field of Blood is not an onslaught of information. There are others who offer a more detailed read on this campaign (Scott Hartwig's new book comes to mind). But this is not to suggest that Vermilya's narrative runs thin. There is more than enough here for the Civil War enthusiast to get their head around the main points of the campaign and the September 17 battle. And what's really great - this book functions as a tour guide of sorts, noting important sites to visit on the battlefield in a step-by-step fashion. Vermilya also expands the scope to challenge some well-worn conventional wisdom. For example, military historians often underscore Antietam as three distinct battles taking place in order on one day, rather than as working parts of a bigger whole. Vermilya is also remarkably sympathetic in his review of McClellan's generalship in Maryland...something historians have long criticized. Now...I might have to pick a nit or two here. I'll agree that Little Mac built a hell of an army and was a talented administrator, but I am less convinced of his command skills in combat (and shortly thereafter). Though I had a hard time with Vermilya's take on McClellan, I will admit that he challenged my thinking on the man. And any well-executed book should do exactly that. 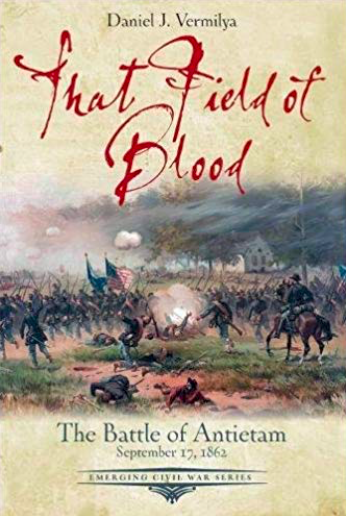 So even if one has a good working knowledge of Antietam and are set on their ideas about Lee, McClellan, or any of the other main actors and events of the battle it is worth checking out That Field of Blood for the analysis alone. This book is also a must for those making their first trip to Antietam. It is a thin volume (146 pages with appendices) written in an accessible style. Buy it, read it, think about it...then go to the battlefield. I've always stressed that standing in the very spot where significant historical events took place is essential when attempting to take in the full scale of the history. On the battlefield, That Field of Blood would make a great companion to the experience.